Die bestemming wat julle kies in die huwelik, is om julle liefde vir mekaar te verklaar - om jou maat se beste vriend, vertroueling, klankbord, minnaar en luisteraar te wees. By choosing to marry, this is the time for you to declare your love to each other, to be a best friend, confidant, sounding board, lover and listener. I live in Auckland and have noticed that more and more South Africans are immigrating to New Zealand. When I first arrived on these shores in 1984, there were very few South Africans living here. I can truly understand what it is like living in a "strange" land and learning new lifestyles and customs. It is not always easy. Some of us like to retain a little of our heritage. Perhaps you would like to say your vows, ring pledges and/or declarations to each other in Afrikaans, to make your bond more personal to you? They should also be spoken in English so that the congregtion that witness your marriage understand your vows, pledges and declarations to each other. I am able to offer you this option for your wedding, whether you are both Afrikaans speaking or not. I will listen to you both and help you plan the perfect balance in your ceremony. 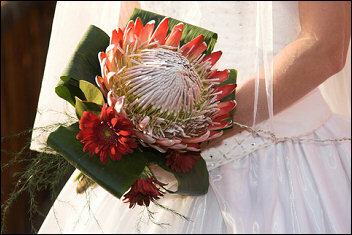 I am also available to marry visiting couples who come to New Zealand from South Africa. Arrangements can be made via email and phone. Ek hoop om julle spesiale dag, onvergeetlik te maak.